"Caltrans" redirects here. It is not to be confused with Caltrain. The California Department of Transportation (Caltrans) is an executive department of the US state of California. The department is part of the cabinet-level California State Transportation Agency (CalSTA). Caltrans is headquartered in Sacramento. Caltrans manages the state's highway system, which includes the California Freeway and Expressway System, and is involved with public transportation systems throughout the state. It supports Amtrak California and Amtrak's Capitol Corridor. In 2015, Caltrans released a new mission statement: "Provide a safe, sustainable, integrated and efficient transportation system to enhance California’s economy and livability." 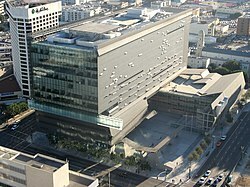 Caltrans District 7 Headquarters in Los Angeles, designed by Thom Mayne. The earliest predecessor of Caltrans was the Bureau of Highways, which was created by the California Legislature and signed into law by Governor James Budd in 1895. This agency consisted of three commissioners who were charged with analyzing the state road system and making recommendations. At the time, there was no state highway system, since roads were purely a local responsibility. California's roads consisted of crude dirt roads maintained by county governments, as well as some paved roads within city boundaries, and this ad hoc system was no longer adequate for the needs of the state's rapidly growing population. After the commissioners submitted their report to the governor on November 25, 1896, the legislature replaced the Bureau with the Department of Highways. In 1913, the California State Legislature began requiring vehicle registration and allocated the resulting funds to support regular highway maintenance. In 1921, the state legislature turned the Department of Engineering into the Department of Public Works. The history of Caltrans and its predecessor agencies during the 20th century was marked by many firsts. It was one of the first agencies in the United States to paint centerlines on highways statewide; the first to build a freeway west of the Mississippi River; the first to build a four-level stack interchange; the first to develop and deploy non-reflective raised pavement markers, better known as Botts' dots; and one of the first to implement dedicated freeway-to-freeway connector ramps for high-occupancy vehicle lanes. In late 1972, the legislature approved a reorganization, suggested by a study initiated by then-Governor Ronald Reagan, in which the Department of Public Works was merged with the Department of Aeronautics to become the modern California Department of Transportation. 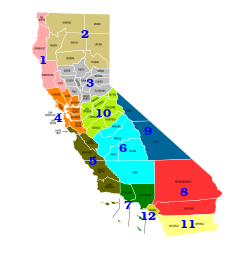 For administrative purposes, Caltrans divides the State of California into 12 districts, supervised by district offices. Most districts cover multiple counties; District 12 (Orange County) is the only district with one county. The largest districts by population are District 4 (San Francisco Bay Area) and District 7 (Los Angeles and Ventura counties). Like most state agencies, Caltrans maintains its headquarters in Sacramento, which is covered by District 3. ^ Willits was the northernmost California Coast Range city connected to the national rail network when the headquarters were established there. ^ The Forsythe Building was shared with the original Gottschalks department store. ^ "Caltrans Executive Fact Book" (PDF). May 2016. ^ Taylor, Mac. "The 2016–17 Budget Transportation Proposals" (PDF). Legislative Analyst's Office. Legislative Analyst's Office of California. Retrieved 21 September 2016. ^ "State of California Department of Transportation February 2018 Organization Chart" (PDF). Caltrans. February 2018. Archived from the original (PDF) on 24 February 2018. Retrieved 24 February 2018. ^ "Caltrans Mail Addresses." California Department of Transportation. Retrieved on November 19, 2009. ^ "Caltrans Mission, Vision, Goals & Values". Caltrans. Retrieved 26 September 2016. ^ Raymond Forsyth and Joseph Hagwood, One Hundred Years of Progress (Sacramento: California Transportation Foundation, 1996): 12. ^ Raymond Forsyth and Joseph Hagwood, One Hundred Years of Progress (Sacramento: California Transportation Foundation, 1996): 13. ^ Ellis, W.R. (1913). "Division Engineers – Office Addresses". California Highway Bulletin. California Highway Commission. 1 (2): 2&3. ^ Raymond Forsyth and Joseph Hagwood, One Hundred Years of Progress (Sacramento: California Transportation Foundation, 1996): 32. ^ Raymond Forsyth and Joseph Hagwood, One Hundred Years of Progress (Sacramento: California Transportation Foundation, 1996): 128. ^ "Caltrans District Offices". California Department of Transportation. Archived from the original on 2010-02-11. Retrieved 2010-02-13. ^ "News Release D12 Move to Santa Ana October 2016 (PDF)" (PDF). Wikimedia Commons has media related to California Department of Transportation.